Currently, researchers are investigating the effects of taijiquan on numerous medical conditions such as high blood pressure, arthritis, Alzheimer's and Parkinson's diseases. Although results from such studies may not be available for some time, people who have regular taiji practice consistently report overall health improvement, increased energy, and an improved sense of well being. 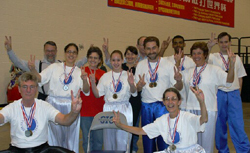 Taijiquan, International Competitive Sport, Benefits You . . .
As we approach The 2008 Olympic Games in Beijing, China, more and more people will become aware that taijiquan has long been a competitive sport. In recent years, Forms Competitions and Pushing Hands have grown in popularity. One reason for this is that people of all ages can participate. You don't have to be young, but the training is very demanding. Connect with and celebrate a great tradition: Although relatively new to America, taijiquan is tremendously popular worldwide. During any given 24-hour period of time, someone, somewhere is always playing taijiquan. 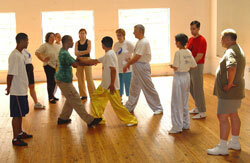 Furthermore, taijiquan has a history that dates back many generations. When you practice taijiquan, you become a thread in an enormous, invisible piece of fabric that encompasses the world and stretches into both the past and future. When we compete or perform publicly, we connect with the rest of the world and with the masters who came before us and who will follow us. We make this fabric visible to the world. When we "show off" our skills publicly, we are studying a lesson in humility, a lesson about being a part of something much bigger than ourselves. Taijiquan, Martial Art, Benefits You . . .
is precious and none can be replaced." Although years of devoted practice are required to achieve high level martial skill using taijiquan, many benefits may be gained through the process. 10 Fundamental Principles of Taijiquan 1. The head is kept upright in a relaxed way. 2. Chest is loose, never pushed forward. 3. The waist is loose and relaxed. 4. Distinguish between "solid" and "empty". 5. Shoulders and elbows are down. 6. Use the mind/will to move, not physical strength. 7. Upper and lower body are coordinated. 8. Internal and external are unified. Mind and body function together. 9. Movement is continuous and coordinated with the breath. 10. Seek stillness in the movement. ©2019 Mei Zhong Yang Style Taijiquan Association, U.S.A.
Search Engine Optimization and Website Maintenance provided by WebXperts Design, Inc.